Yummo Mummo | Guest blogger – HER top 5 items! Hello! Firstly, thanks to Melissa for giving me the opportunity to guest post on Yummo Mummo! I’m so happy to share with you the top 5 items in my wardrobe and the ways that I like to wear them. I hope these give you some ideas on how you can have fun with your own wardrobe and make the most of what you’ve got! I treat khaki as a neutral as it goes with so many other colours. This khaki jacket in particular is such a versatile piece of clothing – it’s perfect as a cover up in fall and spring when the nights get cool, and makes a great layering piece in winter either as outerwear if you’re in a milder climate, or under a heavier jacket if it’s colder where you live. I love wearing it with white – either a white top or a pair of white jeans – they make a nice contrast and the jacket really makes the white pop. Of course, just make sure you have the Napisan [or whatever brand it is they have in the US] ready! I’m obsessed with stripes – perhaps being a bit of a Francophile I love how they have an air of French style about them. It’s so easy to create an outfit with a striped shirt – if you have limited time in the mornings what with getting kids ready for school etc, pair the striped shirt with a plain bottom and some flats and you’re ready for the day! 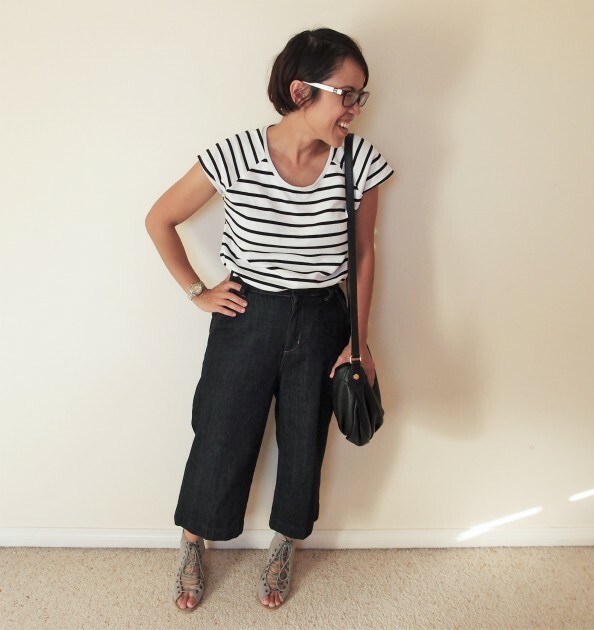 I’ve only just gotten into culottes and I like how these and the striped shirt have a nautical effect. YummoMummo note – Stripes, STRIPES, fabulous Stripes. You can never have too many stripes in your wardrobe! Button down shirts are another great option for those of us short on time in the morning – it looks and feels a little more dressed up than a t-shirt, even if you’re wearing it with jeans. Gingham print is classic yet fun, and in a neutral colour like navy blue and white can be easily worn to the office as well as to weekend brunch with friends. I like the shape of pencil skirts, but I thought I’d keep the fun element of the shirt by wearing it with a pair of white sneakers. 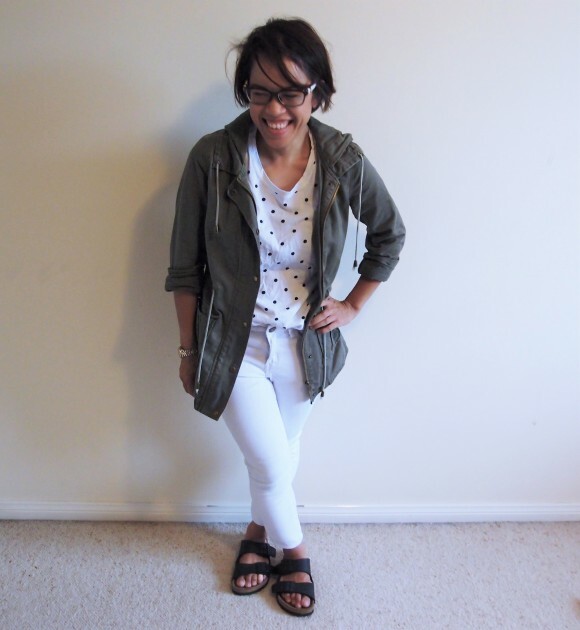 YummoMummo note – Love how Eileen has added the tennis shoes to a button down. Talk about stylish and comfortable for a mum on the run! The denim (or chambray) shirt is another versatile item to have in your wardrobe – buttoned up, it can be worn as a regular shirt; unbuttoned, as a lighter alternative to a denim jacket. 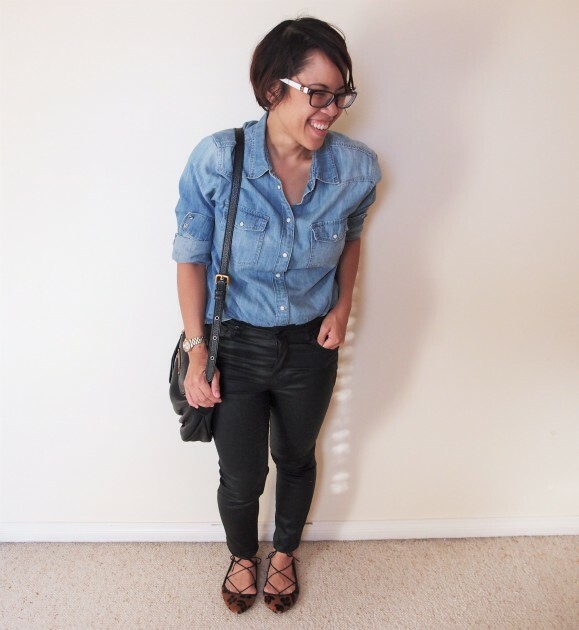 As with jeans, it goes with pretty much everything, and I love the combination of denim and leather – it must be the rock and roll I listened to as a teenager. However, as leather isn’t so forgiving when you have little ones, a nice alternative is waxed or coated denim which looks like leather but washes a lot easier. YummoMummo note – I want those shoes!!!!!!!! These are a fabulous change from wearing jeans all the time (which I tend to do) – while they have a denim look, they’re much lighter so are perfect when it gets warmer and jeans get too heavy to wear. With their drawstring waist and loose fit, they’re perfect for moms who still want to look smart but also want to be comfortable! 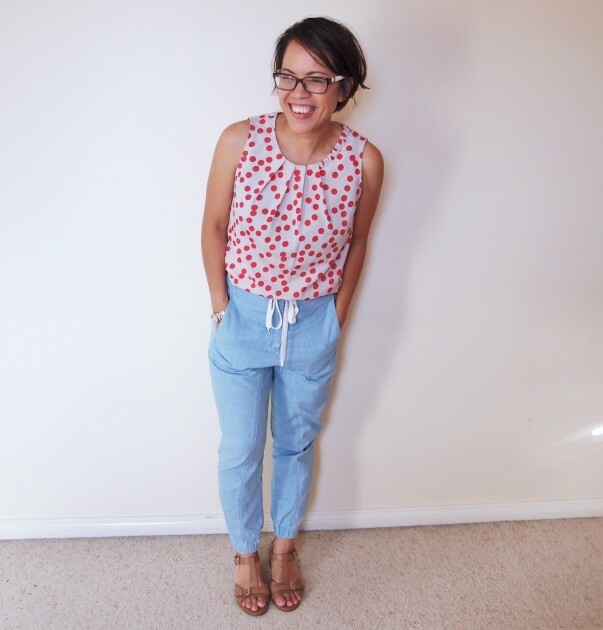 Spots are another favourite print of mine so I wore my pants with a fun polka dot shell top – a breezy outfit for those humid Sydney days! YummoMummo note – this polka dot print top is absolutely adorable. Such a great pop of red against the beautiful blue of chambray. LOVE. I hope this has given you some ideas for your next outfit! What are your favorite items and how to wear them?